In a few short weeks, the thirtieth anniversary of Star Wars will be upon us, as hard as that is for of us many of us X'ers to believe. Honestly, Star Wars changed my life. I was in second grade when I first saw it in 1977, and it was the most dazzling, amazing movie a seven-year old's mind could conceive. I spoke with my Dad about the film a few weeks ago during dinner, and the experience of going to see it at a theater in Paramus, N.J. almost thirty years ago. He told me he staggered out of the first viewing with his head spinning. "The real world," he suggested "seemed to move so slow" after seeing Star Wars. Even thirty years later, I recall that feeling of exuberance; that excitement. George Lucas's space opera has permeated the pop culture in so many ways since '77. It's tempting to gaze at it as some kind of magical watershed production which just appeared - with no antecedents - and went to warp speed, literally, in the public consciousness. Yet the historian in me must remind myself that Star Wars developed the special effects breakthroughs of Brian Johnson and Space:1999 (1975-1977); that Star Wars was originally a variation of Flash Gordon, a property Lucas had first attempted to license; that the film was an homage to such Akira Kurosawa films as The Hidden Fortress; that the blockbuster mentality Star Wars took advantage of had already commenced with such studio films as Jaws (1975); and that even the merchandising blitz it set off had antecedents in Planet of the Apes, Star Trek, The Six-Million Dollar Man, Space:1999 and other genre productions. I can remind myself of all those facts, and yet Star Wars is THAT film. It's the one major production where all these elements came together like a Big Bang to create a work of art that seemed fresh, new and different. So much of "success" is combination of timing and chemistry, and Star Wars has both of those things in its favor. It was released at a time when people were hungry for escapist fare, but it was also so damn inventive; such a well-told and resonant story. It was seeded with brilliant mythological undercurrents and ideas, and therefore it has continued to exist long past the cinematic marketplace of the disco decade. 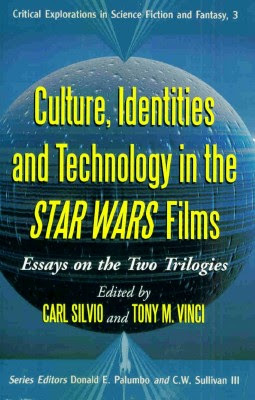 So, it's the perfect time to explore Star Wars' significance in American culture with Critical Explorations in Science Fiction and Fantasy, # 3: Culture, Identities and Technology in the STAR WARS Films: Essays on the Two Trilogies. This is a McFarland collection of fascinating essays edited by Carl Silvio and Tony M. Vinci, and they all gaze seriously and studiously - and intelligently at Star Wars' impact on our culture. I know the elitists out there laugh at such things, the idea that Star Wars can be examined this seriously, but to them, I blow a big fat raspberry. How is examining Star Wars any different, really, than studying The Iliad or The Odyssey? All these works of art reflect their times and worlds in a deep and clearly resonant way. The book's introduction notes, correctly that "few filmic narratives have so captivated the public's imagination" as Star Wars. "The textural universes serves as one of society's richest repositories of contemporary myth and social meaning, a galaxy where collective hopes and anxieties are both revealed and imaginarily resolved." Indeed. I couldn't agree more, so it was with great enthusiasm that I read further. Part I of the Book, "Cultural Contexts" meditates on the "value of rebellion and the dangers of blind democracy," among other things, a particularly relevant topic given today's theory of the Unitary Executive. Another essay, by John Lyden gazes at "apocalyptic fatalism" in Star Wars, the idea that "the plan revealed for the future is set and no one can change it." 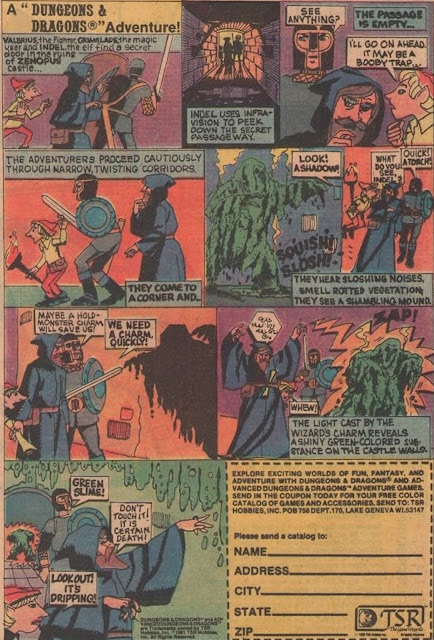 As evidence of this facet of the tale, Lyden points to all the talk of "destiny" in the Original Trilogy, and character comments such as the Emperor (and Vader's) taunt that "it is useless to resist," meaning that there is a foregone conclusion in Luke Skywalker's journey to hero (or perhaps, villain...). Part II of this collection of essays focuses on "Identity" and "Politics." One essay is called "The Imperial March: The Galactic Empire as Racial State," but it was "Feminism and The Force" by Diana Dominquez that fascinated me most in this section. Dominguez writes that old fashioned, patriarchal archetypes are shattered in Star Wars during Luke's first meeting of Leia. As you'll recall, he's found her in her prison cell on the Death Star, and she comments that he's "short" for a "stormtrooper." This comeback destroys, according to Dominguez, "The familiar fairy tale trope of the fair unknown knight or prince in shining armor who comes to save the silent but eternally grateful damsel in distress and whisk her away to safety and a life of happily ever after." I remember reading an interview with Buster Crabbe - then an old man - on why he didn't like Star Wars and he pointed to this "liberated" quality to Princess Leia. Interestingly, Dominguez also sees Padme Amidala of the prequel trilogy in rather positive light. After noting that she goes from being "outspoken" Queen to dying over love - essentially standing by her man (as the song goes...) -Dominguez describes Amidala as an "alarming reflection of the complex, confusing and contradictory messages today's young women receive from society and the media." The third part of the book was probably my favorite, simply because it aligns with many of my own particular interests. It's sub-titled "Technology and The Public Image" and there's a terrific essay called "Kill Binks" by Dan North, subtitled, "Why the World Hated its First Digital Actor"). It studies the vehement fan response to Jar-Jar Binks, and enumerates many reasons for it. Equally fascinating is "The Emperor's New Clones; Or Digitization and Walter Benjamin in the Star Wars Universe by Graham Lyons and Janice Morris. This essay studies the impact of Lucas's digital tinkering with the saga to conform to what the artist insists is his original vision for the trilogies. In other words, digitization as "balm" for what the creator perceived as the shortcomings of his original presentation. This essay is even-handed and gazes at how some of the special edition upgrades are positive, while others are quite bewildering. In discussing the addition of a (bad) CGI Jabba the Hut to Episode IV: A New Hope, the authors discuss how an actor's performance (in this case, Harrison Ford's), loses it's "integral" "wholeness" and becomes disjointed and no longer authentic. This is something I've had ample time to consider myself, and discuss with a friend, Tony Mercer, on my own production, The House Between. What happens to actor performances when new special effects and sound effects are added; and the actors are no longer registering the context they imagined? Or that the script initially imagined? This is a fascinating debate, especially in the age of CGI and digital "fixes." There's even a section here on the "Who Shot First?" debate, regarding Greedo and Han in the cantina, and it's stimulating reading. Here on the blog over the next few months, I'll be celebrating the 30th anniversary of Star Wars with lots of different posts (and picking up my blogging of the films...), but I can think of no better way to kick off that endeavor than with a careful reading of this fascinating collection of essays.